Eugene Polley (born in Chicago, 29 November 1915 - died in Downers Grove, Illinois, May 20, 2012 at age 96 years) is an engineer and engineering manager at Zenith Electronics is known as the creator of the wireless remote control for television. Inventor of the television remote control device died at the age of 96 years. Diinfokan paper company where she worked. Zenith Electronics said Eugene Polley mengembukan last breath on Sunday (20/5), at Develop a hospital in Chicago, United States. 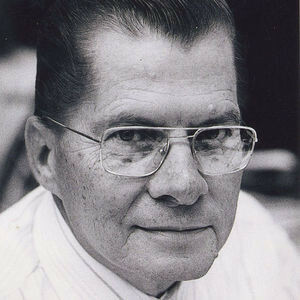 Eugene J. Polley was born 29 November 1915 in Chicago, Illinois. He studied at City Colleges of Chicago and the Armour Institute of Technology, but get out before graduating. In 1935, he accepted work as a stock clerk at Zenith Electronics. He then moved to the spare parts, the first place make a catalog of goods for the company where she worked. After that, he moved to the technique. In that place duties include making radar for the U.S. Department of Homeland Security during World War II. Flash-Matic Polley found that function directs light to the cells in every corner of the photo to turn off the television and changing channels. Tools that he found in 1955. The findings were then becomes a luxury appliance before television crowded with hundreds of cable channels. His invention in 1955 sold as the name of the Flash-Matic. They can control the television from a distance by using visible light. The television must be equipped with photo cells on the screen. With Flash-Matic, television can be turned on and off, and changed the channel from a distance. Polley also make the car radio system and the press participated in the development of video disk. Flash-Matic is a luxury in the 50's era. Because the Flash-Matic using light to operate the television, the tool was not stable and its performance is interrupted by another light. The findings were followed by sonic control device, then the infrared light and radio frequency. Before Polley find Flash Matic, the first control device made in Zenith is still using a cable connected to the television. "He was very proud of the flat-screen TV and modern remote control. He always kept its findings," said Zenith spokesman John Taylor. Polley died of old age on Sunday, May 20th, 2012 at Advocate Good Samaritan Hospital, Downers Grove, Chicago. News of his death was announced by Zenith Electronics, where he worked from 1935 to 1982. Polley position ever held while working at Zenith, including product engineers and mechanical engineers. Polley then became manager of Video Recording Group, before being transferred to Advanced Mechanical Design Group. His last position as Assistant Chief of the Division for Mechanical Engineering Group Zenith. He retired after working for 47 years and produced a total of 18 U.S. patents. Polley with Robert Adler won the Technology & Engineering Emmy Award 1996-1997 as the "Pioneer Development of Wireless Remote Control for Television Consumer". In 2009, Polley received the IEEE Consumer Electronics Award for "contributions in the technology of wireless remote control for televisions and other consumer electronics products. Polley received an Emmy award in 1997 with Zenith engineer Robert Adler. Polley was born in Chicago in 1915. He began his career in engineering field since 1935. He also worked at Zenith for 47 years, and has 18 patents on various findings in the U.S.